This is another review of picture books nominated for the 2012 Canadian Children's Book Centre Awards. See the others here. Small Saul wants nothing more than to live a life at sea, and has since he was a tike dreaming in the bath. But he's different than other sailors, he's too small for the navy and too gentle to be a buccaneer. He goes to Pirate College and joins the crew of The Rusty Squid and tries hard to fit in, but although he can sing sea shanties and swab the deck he has trouble looting and with his sword. How will he prove to the other pirates that he is the real treasure they are seeking? Just like the other Spires titles I have reviewed (Binky Under Pressure, Larf), this book is funny. 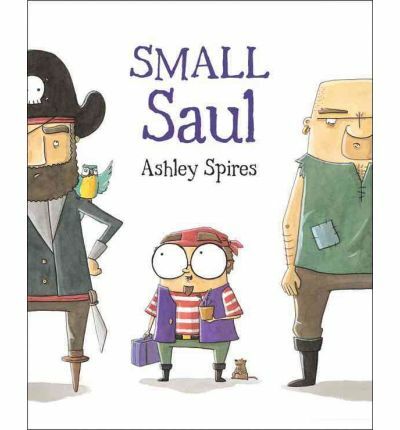 The words and the premise are funny, and the illustrations add even more sight gags to elicit giggles from all readers. But it's not just funny, it has a great message for kids who feel they might not fit in, about believing in yourself and your uniqueness. As a parent I love the message of the book, but also those little extras. Kids Can Press has a download on their site for storytime ideas and a maze for kids to use. I love that plus alpha from publishers. This is the last of the five books nominated for the Marilyn Baillie Picture Book Award, for picture books in English, that I have reviewed. I never get predictions right, but here's what I think! I think that the gorgeous and timeless Cinnamon Baby is the frontrunner, but if they are going for pure kid appeal then Small Saul will get the nod. Find out sometime in the next few weeks! This is the sixteenth book I have reviewed for the Sixth Canadian Book Challenge. It's SO cute. Looks adorable. That Spires lady is on fire! So talented and productive. When I Get Older: The Story Behind "Wavin' Flag"